The Euskalduna Conference Centre (in euskera Euskalduna Jauregia), is a conference, show and exhibition venue situated on one of the river banks of Bilbao (Basque Country), where the former Euskalduna shipyards were established. 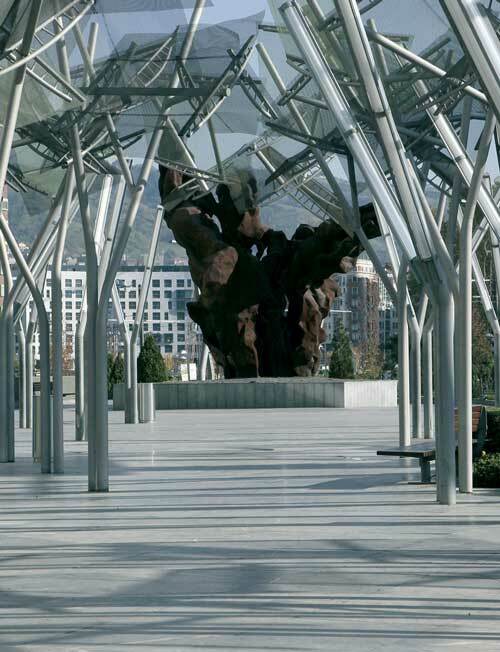 It was inaugurated in 1999 and designed by the local arquitect Dolores Palacios and her husband and colleague, Federico Soriano. The headquarters of the Bilbao Symphony Orchestra (BOS, Bilbao Orkestra Sinfonikoa) are located here, an orchestra that was founded in 1920 and has been performing since 1922. The Euskalduna Centre won the Enric Miralles award for architecture at the 6th Spanish Architecture Biennial in 2001. It was also considered to be the best congress centre in the world by the International Association of Convention Centres in the year 2003. The building contains a wide range of spaces different purposes: an auditorium, several congress halls and meeting rooms, offices, foyers and an exhibition hall, along with specific service areas including storage space, cloakrooms, dressing rooms and rehearsal rooms. All in all, it is a 58,200 m² multi-purpose complex is within walking distance of the Guggengeim museum. Bilbao airport is also easy and fast to reach from there. Several pieces of art may be found both inside and outside the building: ‘Dodekathlos’ of Vicente Larrea, ‘Terpsícore’of Salvador Dalí and ‘Apollo XIV’ of Amadeo Gabino, to name a few.